The Ranger R745 is the perfect no-frills tire changer for entry level tire and wheel service. Efficient, effective and ideal for rapid wheel service on most wheel types, the Ranger R745 is the perfect no-frills tire changer for entry-level tire and wheel service. The Ranger R745 is a rigid tower tire machine designed to handle the needs of heavy volume tire shops. A sturdy body, rigid 45mm hexagonal vertical shaft and hardened-steel horizontal outrigger support arm eliminate flex during all tire service procedures to reduce the chance of expensive wheels getting damaged. A supersized turntable provides an internal clamping capacity of 21" and external clamping capacity of 18". With a long list of time-saving features and a powerful pneumatic optional assist helper, you’ll safely mount low-profile performance tires and wheels with little effort. Featuring faster operating speeds and reverse-direction control for easier tire swaps, this tire changer reduces the risk of tire damage, especially for low-profile and run-flat beads that need time to relax. The R745 tire changers are fit with an advanced bead breaker arm. Its durable construction ensures better mechanical strength, as well as many years of dependable service life. A rubber bump stop ensures a smooth arm return, lessening shock loading and minimizing any wear on the pneumatic cylinder. Other moving parts are also kept safe by the bump stop. All Ranger tire changers feature 100% forged steel foot pedals. 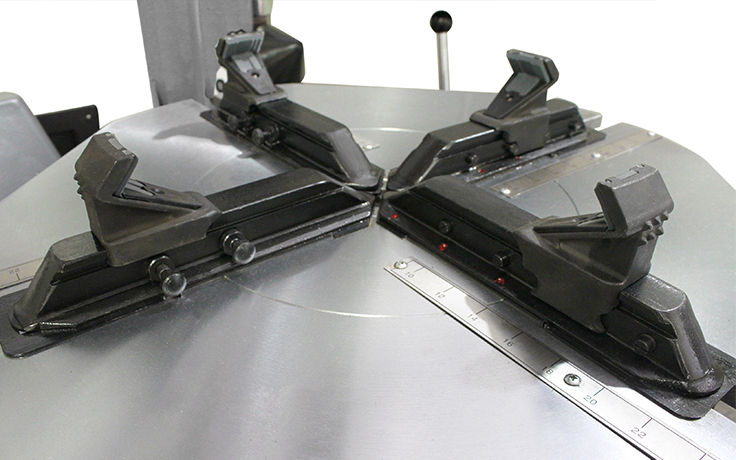 This design makes the foot pedals remarkably lightweight, durable and non-reactive with chemicals, liquids and other inadvertent environmental elements. As the most-exposed part of your tire changer, it was important to us that we find the best material for your shop. 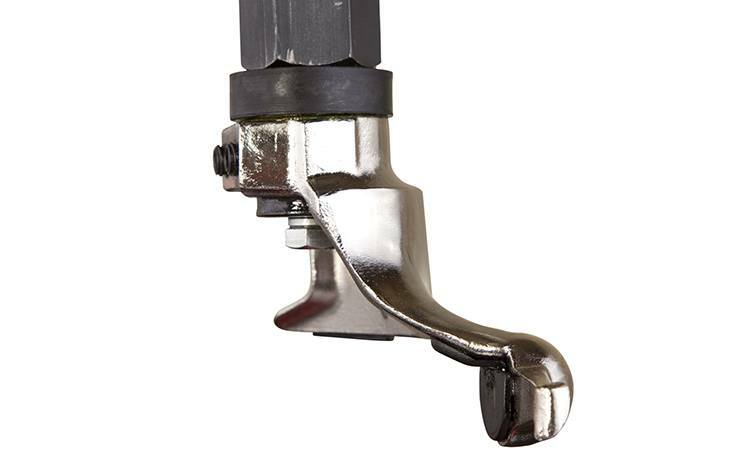 Many other brands use cast-iron pedals, which are heavy, susceptible to rust and require more maintenance over time. Protecting the internal workings of your tire changer is first and foremost in our minds, so there’s little to no component maintenance for you to worry about. Every main‐lead electrical terminal, auxiliary switch and motor enclosure is air‐tight, dust‐free and utterly safe from contamination. Our R745 tire changers come standard with high-pressure polyurethane pneumatic tubing that’s constructed with a smooth, seamless bore to improve flow. The tire changer’s tubing boasts a high abrasion resistance, as well as high burst tolerance and total kink resistance. The convex sidewalls on the R745’s drive-belt evenly disperse wear. 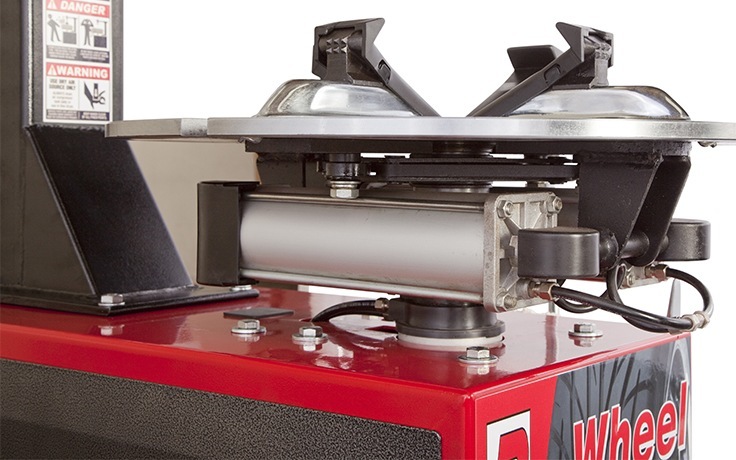 As a result, the tire changer itself lasts significantly longer in your shop due to the improved belt support. Flex‐bonded cords and flex‐weave covers keep away contaminants and pollutants, such as water and oil, as well as weather conditions that are out of your control. Ranger is proud to offer tire changers so well-constructed, you never have to service their gearboxes. The R745 tire changer is no different. 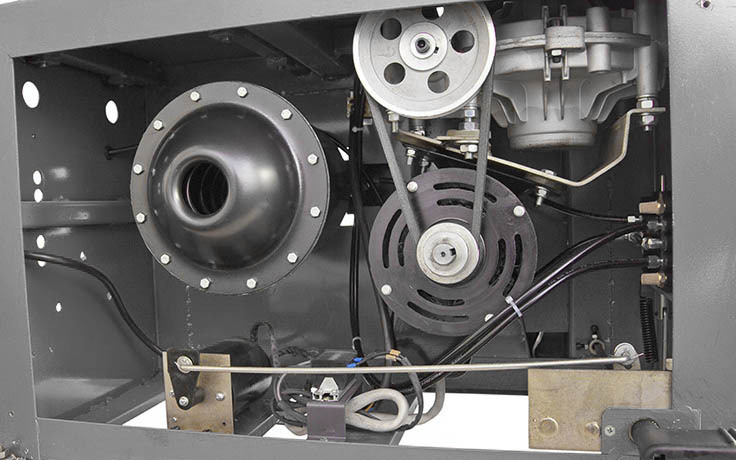 Like our other models, it features an impressive oil and grease tank, which releases heat and better lubricates the components. Internal baffles work in conjunction with a constant-seating stress flange gasket to provide low temperatures though superior venting and zero fluid leakage. Ranger RimGuard™ steel wheel clamps feature both internal and external multi‐teeth jaws. Your tire changer is capable of handling vertical mounting bolts that make tire replacement faster and simpler than ever. We keep our tire changer controls upfront and logically arranged for both speed and ease-of-use. 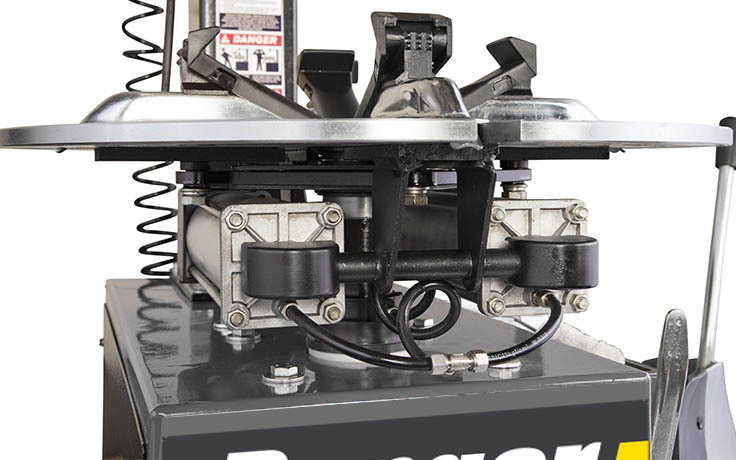 To keep machine vibration and fiction levels low and extend the life of your tire changer, Ranger optimizes the stainless steel and aluminum pneumatic cylinders. Specifically, we’ve made sure internal end-of-stroke cushions come included on each cylinder, protecting the seals, wear band and piston rod. Each cylinder is continuously lubricated during use, further lengthening the life of your unit and strengthening our claim that Ranger makes the best tire changers in the world. The equi-dimensional shape of our mount and demount head lets you change tires without changing the position of the tool head. 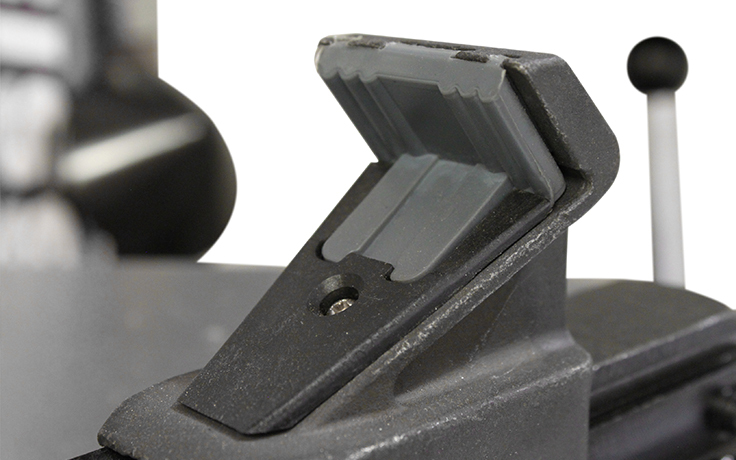 The tool head surface is manufactured micro-smooth, so mounting gliding tire beads into place is easy. Your tire changer is useless if it busts tires during routine operations, so our hardened alloy steel mount and demount head is specially designed to keep your tires safe at all times, even in the busiest shop environments. 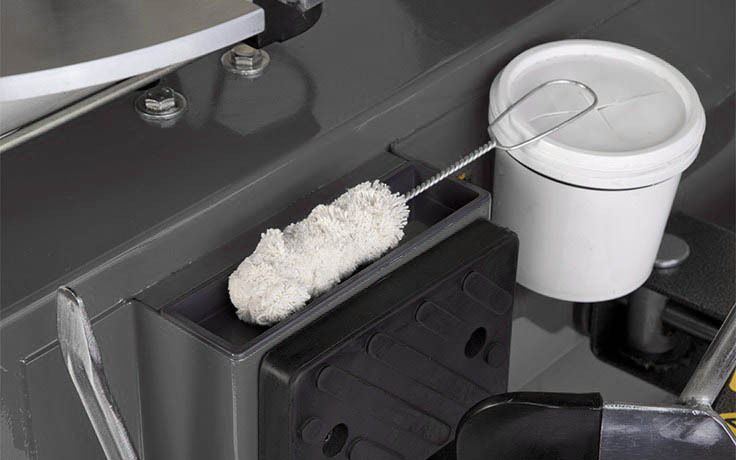 We want you to have the means to clean, protect and maintain your tire changer without having to spend extra or go out of your way. A soap bucket and brush comes standard, along with turntable jaw covers, bead‐breaker blade boots and mount / demount head covers. Everything can be stored right in the tire changer itself, so you’re not losing things, searching around the shop and ordering extras of what you think you’ve lost. To keep you swapping tires with the best of them, a steel tire iron and bead lever tool comes included with your purchase. You’ll find it is an indispensable tool that every tire changer operator should be familiar with and capable of using during mount and demount procedures. A rigid 45 mm spring assist hexagonal vertical tool shaft and hardened‐steel horizontal outrigger support arm keep the mount-demount tool head perfectly still during operations. This all but ensures you won’t damage expensive wheels due to a loose or shifting tool head. The tire changer is fitted with linear guide bearings that make it easy to adjust both the vertical and horizontal wheel settings. These guide bearings are completely maintenance-free for the entire lifespan of your tire changer. The non‐flex horizontal arm boasts a hardened lower roller guide for controlled, balanced movements. A pistol-type tire inflator with a sure‐grip clip‐on valve chuck has never been easier to operate and permits full-function, hands‐free operation. Keep your shop clean, calm and ready for anything. Your tire changer has enough storage to hold all provided tools and accessories, as well as other items you want nearby while you work. If you need to service motorcycles, you need a set of optional motorcycle turntable clamps to accompany your tire changer purchase. They’re rugged, dependable and guaranteed to add versatility to your work efforts. Click the button below to add the Ranger R745 RimGuard™ 21" Capacity Perfect-No-Frills Entry-Level Tire Changer to your wish list.